and making fine jewellery for over 30 years. Here at Sherry Jewellery, we are able to combine the unique skills of top jewellery design and quality goldsmiths’ craftsmanship, to create unique pieces of original, bespoke jewellery. We feel it’s important, that a bespoke piece of jewellery must be luxurious, worth spending on and give real pleasure. Perfect for engagements, special birthdays, anniversaries, Christmas gifts or any celebration. We can make you real treasures, for those memorable moments. Special occasions, deserve unique gifts. SHERRY has been designing and making high quality precious jewellery for 30 years. Our designer makers are Fellows of the Institute of Professional Goldsmiths. We are known for our craftsmanship and exemplary service, to both discerning and regular clients. Specialising in bespoke diamond engagement rings and made to order jewellery. We can create a wide range of bespoke and unique jewellery, from bespoke diamond engagement rings, to individual mens’ jewellery. We can cater for all tastes , offering a bespoke option. Our specialised expertise and experience, enables us to take care of the all-important detail and produce something tailored and original, that’s a pleasure to give and a joy to wear. Re-modelling old jewellery into new, takes skill and good design. Often, old stones are un-calibrated, which means a truly bespoke mount is the only option to set them securely. We can create unique designs, re-styling your unwanted jewellery into something new and outstanding. 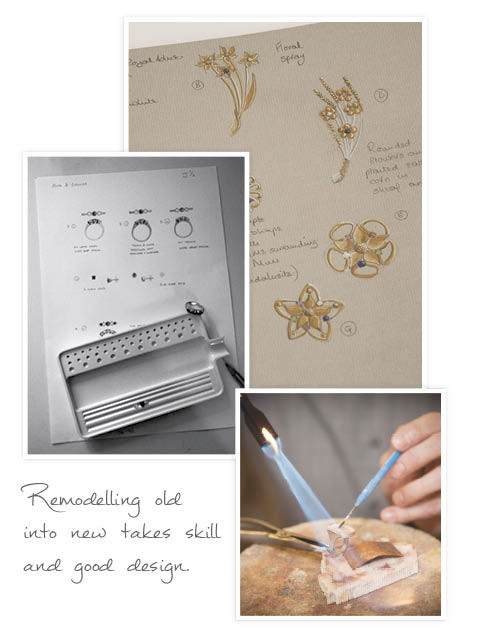 There are many options when re-styling your jewellery and of course, this depends what you’d ultimately like to achieve. 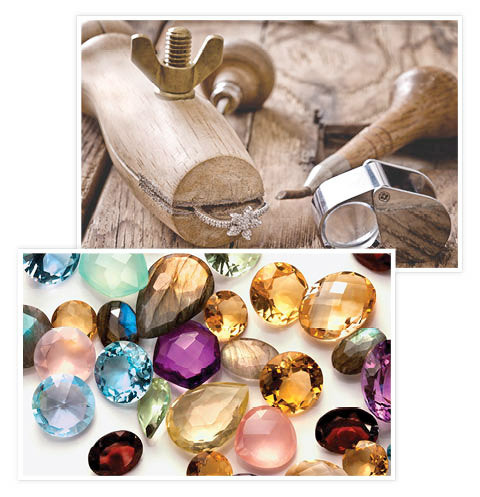 A re-style may involve a completely new creation around original gems; the addition of new stones or metal, or the remaking of a component part. Whatever you decide, the whole process is carried out by us and in our own workshop. It’s possible to use the existing metal to make a new piece of jewellery. This can be done in a number of ways, through melting down and totally reforming an item by hand, to casting a new piece, using the original gold, (though it is sometimes necessary to add gold when recasting). You don’t have to just stick to the materials that you start with. A new piece can be greatly enhanced by adding extra gems, giving extra dynamism to a redesign. Part of the Sherry Jewellery Medici Collection. These extraordinary rings are shown in 9ct and 18ct rose gold. They have a wide, domed profile. All designs are edged with an encrusted diamond band. These are big, statement rings; beautiful and very eye-catching. A variety of widths are available and sizes are made to order. DO YOU REQUIRE SOMETHING DIFFERENT? If you can’t see a service above that best describes your needs then please don’t hesitate to get in contact with us. We have a vast experience within the jewellery industry and have worked on a wide range of varied projects. So please get in touch and we will be happy to discuss any ideas that you have!